Capcom\'s original Onimusha adventure was one of the top-selling games of all time for PS2. Now the creative team behind the initial game has created a sequel to this classic Samurai adventure. Set 10 years in the future from the finale of the original, Onimusha 2 features a new hero and plenty of fresh sword-swingin\' adventures. 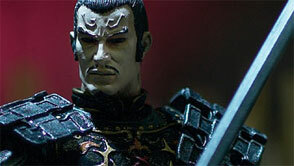 The highly detailed action figures from McFarlane Toys let you re-create the battle in 3D detail. Let the fighting begin.